Why I appreciate veterans in the classroom – Shawna Malvini Redden, Ph.D.
At the end of last semester, one of my students handed me a small, but weighty envelope. When I opened it, I found a thank you card and a large coin with U.S. Marine Corps insignia and the word Veteran at the top. Inside the card, she had written thanks to me for challenging her to go outside of her comfort zone all semester. I felt so moved as we shook hands and said end-of-semester goodbyes. 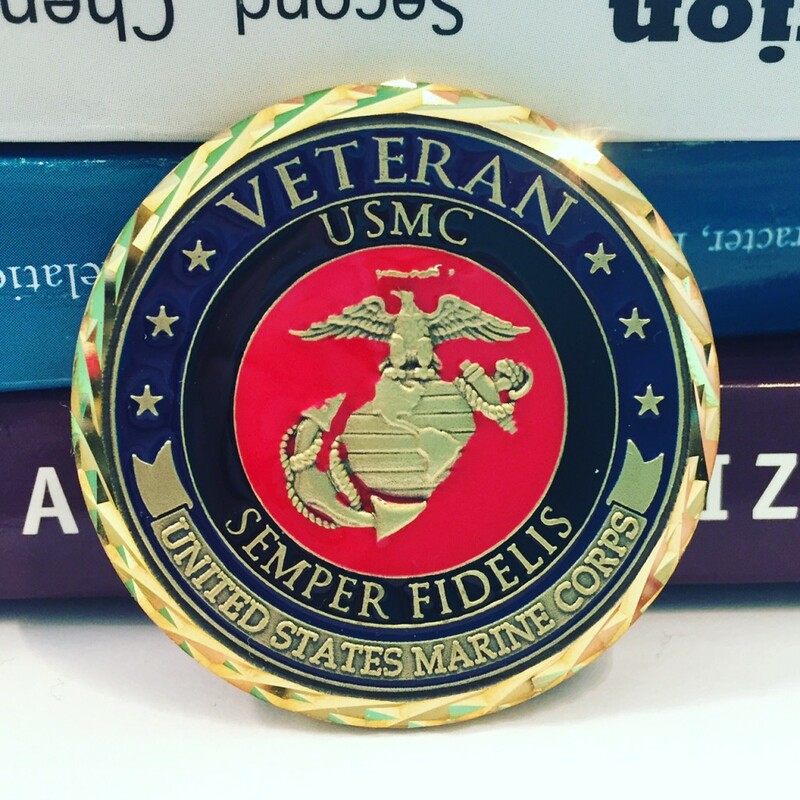 The medallion is a “challenge coin,” historically given to members of an organization, usually military, to signify membership. When challenged, usually at bars I’m told, members must produce coins or buy a round of drinks. And it got me thinking about the last eight years of teaching and how so many of my best and favorite students have been veterans. I appreciate the insight, experience, and complex examples that students who have served bring to classroom discussions. And the level of professionalism and courtesy usually surpasses their colleagues. What makes these attributes especially stand out to me is how much many student veterans deal with to be in school, on top of the normal stresses of college–Injuries, PTSD, the bureaucracy of Veterans Affairs, to name a few. In class discussions, I’m reminded how much I and the other students take for granted in our day to day. How our ability to sit in a classroom and discuss communication ideals hinges on the sacrifices of others. And so, a huge thank you to all veterans, and particularly those who choose to pursue higher education. This teacher appreciates you very much.